Capital Radio was a different radio station in more ways than one. It was set up by the executive director of the International Broadcasters' Society, a Dutch-based organisation which looked after the interests of people involved in broadcasting throughout the world. 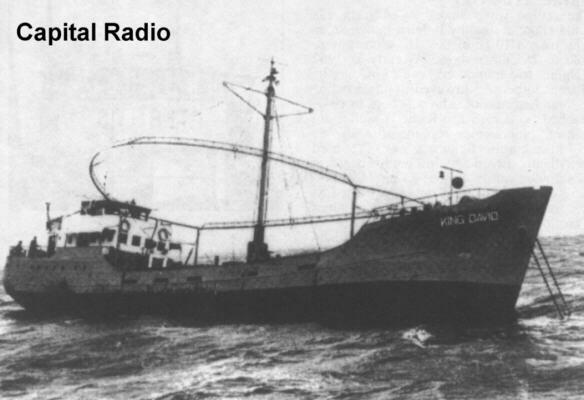 The ship, MV King David (pictured), was fitted with the transmitting equipment from the former Radio 270 ship, the Oceaan 7, and the antenna was unique in that it was circular and transmitted a ground wave with no sky wave, making it less likely to interfere with stations ashore. From 25/4/70 onwards, attempts were made to transmit test broadcasts from positions off the Dutch coast with the ship having to return to harbour for repairs due to storm damage. After various antenna problems, regular programmes began on 11/9/70 with a middle-of-the-road music policy mixed with an odd variety of offshore radio slots, Latin American and C & W music and religious programmes. On 10/11/70 the ship lost her anchor and drifted aground onto the shore at Noordwijk, Holland. This was basically the end of her as the station operators had gone bankrupt and yet another exciting project bit the dust. Recordings of the station are very scarce, but the museum has a recording of a test transmission from Capital Radio.